Is Honda About To Launch A New Electric Sub-Brand? A recent trademark filing may have revealed the name of Honda’s first fully electric car or a new sub-brand. In just a few weeks, Honda will unveil a new prototype electric city car at the 2019 Geneva Motor Show, which is expected to preview the final production version of the compact Urban EV Concept. Thanks to a recently discovered trademark, we may now know the name of Honda's first fully electric car. As discovered by HybridCars, the Japanese automaker recently filed trademark applications in both Switzerland and the EU for the name "Honda e,” which could be the name of Honda’s first mass-produced EV. So far, the model previewed by the Urban EV Concept is the only fully electric Honda confirmed to be in development unless the automaker is planning another surprise reveal at Geneva. Alternatively, the "e" name could be used to represent a new EV sub-brand from Honda. It may not be the most imaginative name, but it would match similar systems used by BMW, Audi, and Mercedes-Benz to distinguish their electric vehicles. The name was filed under a trademark classification reserve for automobiles, specifically "apparatus for locomotion by land, air or water; and parts and fittings for the aforesaid goods.” That doesn't give us much to go on, but we'll hopefully find out more at Geneva next month. Ahead of its Geneva debut, Honda recently released a couple of photos of its unnamed EV, which is referred to as a "compact electric vehicle prototype,” for now. The design will be heavily inspired by the Urban EV Concept, with similar round LED headlights, a black grille, and rearview cameras instead of traditional side mirrors. Unlike the concept, however, the production version will be more practical as it will feature five doors instead of three. Another teaser image previewed the car's futuristic full-width dashboard that incorporates "clean design elements” and "intuitive user-focused technology,” along with wood trim and a multifunction two-spoke steering wheel. 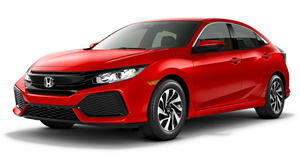 The Civic Sport Touring Hatchback is no hot-hatch.